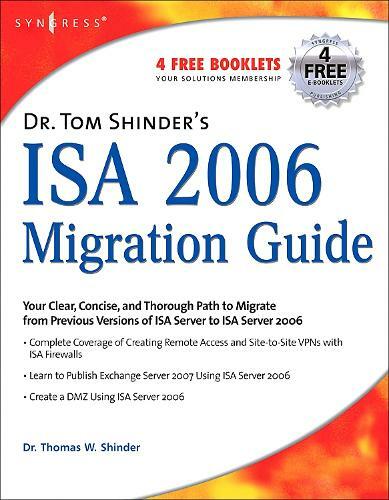 Dr. Tom Shinder's ISA Server 2006 Migration Guide provides a clear, concise, and thorough path to migrate from previous versions of ISA Server to ISA Server 2006. ISA Server 2006 is an incremental upgrade from ISA Server 2004, this book provides all of the tips and tricks to perform a successful migration, rather than rehash all of the features which were rolled out in ISA Server 2004. Also, learn to publish Exchange Server 2007 with ISA 2006 and to build a DMZ. * Highlights key issues for migrating from previous versions of ISA Server to ISA Server 2006. * Learn to Publish Exchange Server 2007 Using ISA Server 2006. * Create a DMZ using ISA Server 2006.